Description: London, Printed for the Author Sold by Richardson & Urquhart +5 others 1st edition 1774 . Quarto worn calf on 6 raised bands with spine compartments gilt (covers detached lacks both spine labels cover edges very worn) page edges blue. Half title + titlepage +pp Preface +pp blanks with some offsetting from facing text +726pp. First 3 leaves browned for 2cm of margins, a few gatherings with light foxing but generally very clean contents. *A comprehensive work on the economy, commerce and situation of Britain in the 18th century with radical suggestions for improvement. 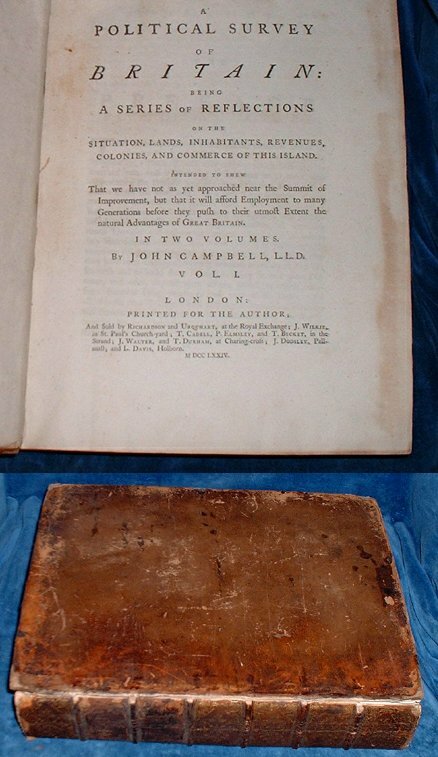 It was published after many years' effort shortly before the author's death - "Dr. Johnson believed that Campbell's disappointment on the indifferent success of the work killed him" (DNB).